Home Sanusi Slider The Emir was absent but in attendance was the Wakili Kano and the governor of Kano Emir of Kano Sanusi secretly marries 18-year old Adamawa princess. 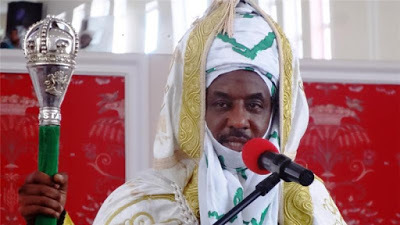 Emir of Kano Sanusi secretly marries 18-year old Adamawa princess. Emir of Kano Sanusi just wedded Lamido Adamawa's daughter Sa'adatu. The Emir was absent but in attendance was the Wakili Kano and the governor of Kano. The wedding took place after juma'at prayers at the Lamido palace. The lady recently completed secondary school and is being enrolled for advanced level studies. The secret wedding fatiha held inside the palace of the Lamido minutes after the Jumma’at prayer. The emir only sent out invitation to some dignitaries across the country, and Kano government officials sneaked into Yola for the wedding fatiha to avoid journalists.